The second and last part containing the two sections of connecting to embedded device will be seen here. I am going to get the support of yaml to store the commands. Before going into how we are going to do it, lets see a bit about what yaml is. yaml or YAML Ain’t Markup Language 🙂 is a human friendly data serialization standard. It has APIs in all programming languages and we are going to use the python version of yaml called the PyYaml. In my words using pyyaml we are going to store the set of commands and their expected output in a human readable format. We will see how. PyYaml has a specific format for storage of the information. We are going to make use of the nesting facility in yaml syntax to nest both a command and its subsequent result together. To learn more about pyyaml and its syntax please visit http://pyyaml.org/wiki/PyYAMLDocumentation. The file is stored as command.yaml and contains information like below. The above format actually corresponds to Python dictionary format where “command” is key and “command_to_be_exec” is the value. This recognition will be important as it will be useful when you look at the parsed output. so using pyyaml we are going to parse and get the commands in pythonic format for easy execution. We parse the contents given above using the load method in pyyaml. The method loads and generates a list of dictionaries where the command to be executed will be value and the “command” word will be key. Exactly as given in the yaml file. Now it will be easy to create a small python module to combine both. Method to parse the yaml file provided and give the contents in pythonic format. file and creating a object for DevConnect class. Now the above code just prints the output executed in the device. But you guys can use these modules in more efficient way and create an entire test suite for the device. That’s all folks. Please dont forget to like my posts if its good and informative. And dont forget to look into the documentation of paramiko and pyyaml. I have provided them in the references. Command execution is one of the important part to be automated in any devices like Switches, Routers or any other embedded device. Any specific task to be done in such embedded devices may result in running a set of commands. This may be a basic configuration or a specific feature configuration done in the device. It is best to automate this as it can reduce the effort of the tester. Lets see a common way of doing this. I am going to take the help of paramiko and pyyaml to do the same. Lets see the first part here. They have explained the API well in the above link. Here we are going to see just a way to connect to device using this package. So first of all we are deciding to create a class for the same. This is because we dont want to make it functional and call the device each and every time for each command to be executed. So how are we going to use paramiko to connect to a device? paramiko has a class with which we can connect to a particular host and port with a username and password provided for authentication. This class is SSHClient. We need to create an object and use connect() method to connect to the device. Now dev_client has connected to the device with hostname “krishnan.device.com” authenticated with credentials “user1” and “password1”. Now we can use the client to execute commands in the device and return the output. This can be done using the exec_command() method in SSHClient Class. This method returns the stdin, stdout and stderr as 3 tuple. We can grep the rc for command execution status. If pass we can check the output variable for output and if fail check the error variable for error. We can even create an interactive shell session for executing string of commands using it. This is done by the method invoke_Shell(). It opens a new channel connected to a pseudo terminal. Now lets see how to put things together in a class. Hi Guys, welcome again to another fascinating part in Experimenting with pygame. In this part I am not going to disappoint you guys. You are actually going to build user interactive game today. Interested?? So as usual, first the code. 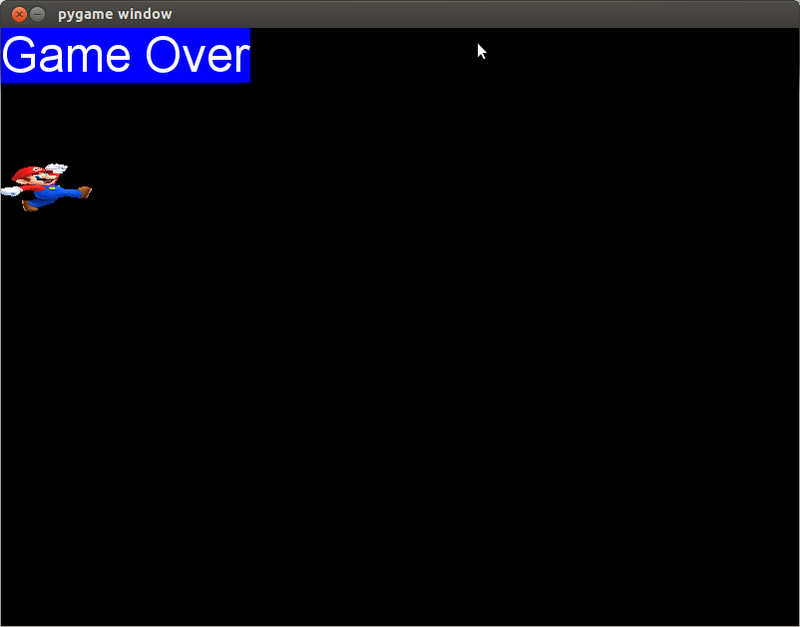 This is a simple function which exits the game because the user lost. The function is called when character hits the window walls. # of the window, user loses the game. So we can see that our amount of code increases as our game logic gets more complex. So most of the parts you guys know. Or else please visit my previous posts to know. The character keeps moving in a particular direction. We need to keep him of the boundary. To change the direction we use the arrow keys. In the previous post the superman moves on his own wish. That is upward.So there was no interaction. But now as a game we are going to need user to control the character using arrow keys. We already know that we have a for loop which gets all events in each iteration. Using this we can solve this. We know that every interaction is an event. So a keyboard key press will also be an event. So we capture that and do the logic accordingly. In the above code we check if the event type is a KEYDOWN. If it is a KEYDOWN we check if it is any of the four arrow keys by checking the key attribute in event. Then according to the key pressed we set the direction control variable. The direction variable is a tuple with two elements depicting the axis to move and the direction to take. So that was the user interaction using keyboard. Now a game should have a win or lose part. The winning part is to keep Mario within bounds. Losing part comes when Mario hits the window boundary. So for this we get the size of image first. Because the coordinates of the image is based on the top left corner of the image and not the complete one. So the image can go beyond boundaries. So we decide this by taking the imagesize and adding it with the actual x and y coordinate to check the boundaries. Finally the based on the direction variable set using keyboard interaction we use the same superman logic to reposition the Mario in the window. Hi Guys. Welcome to the pygame experimentation. Continuing from the previous post, we saw how to print a Hello world like text in the pygame window. That’s nice but not cool. Because when doing game development, we like to see something game like. Yeah now we are talking Game. Let’s now see some game like animation and how to make it. So everybody loves Superman including me. 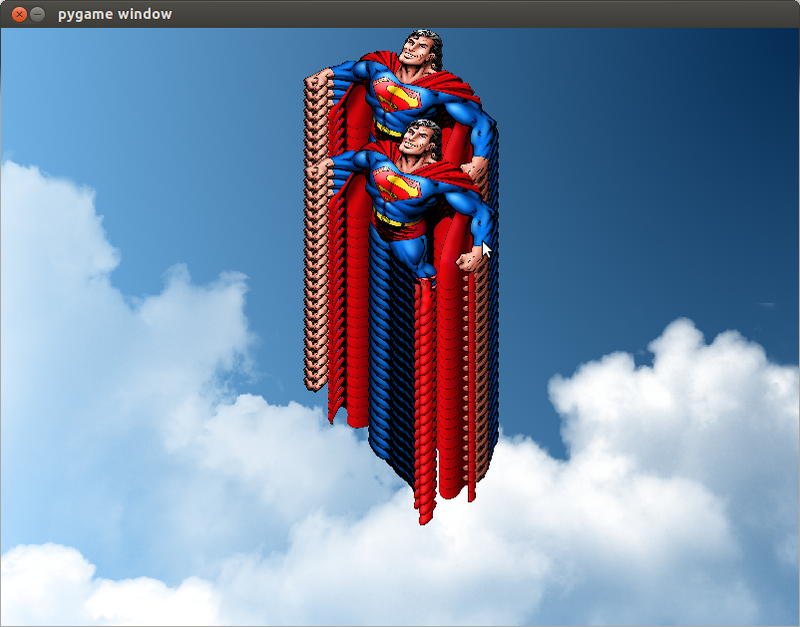 Normal superman flies on his own, but our pygame superman needs our help. So lets make him fly through the clouds. How to load a picture into pygame. How to transform the picture according to the need. How to right a simple code to animate the picture. So here we are going to animate superman to fly straight up amidst the clouds. So we need to get two set of pictures, superman and clouds. So first the code. Then we will break it up. I will exclude the basics of pygame. If you want to know you can go to my first post on pygame. Let’s directly jump into the necessities for this part. 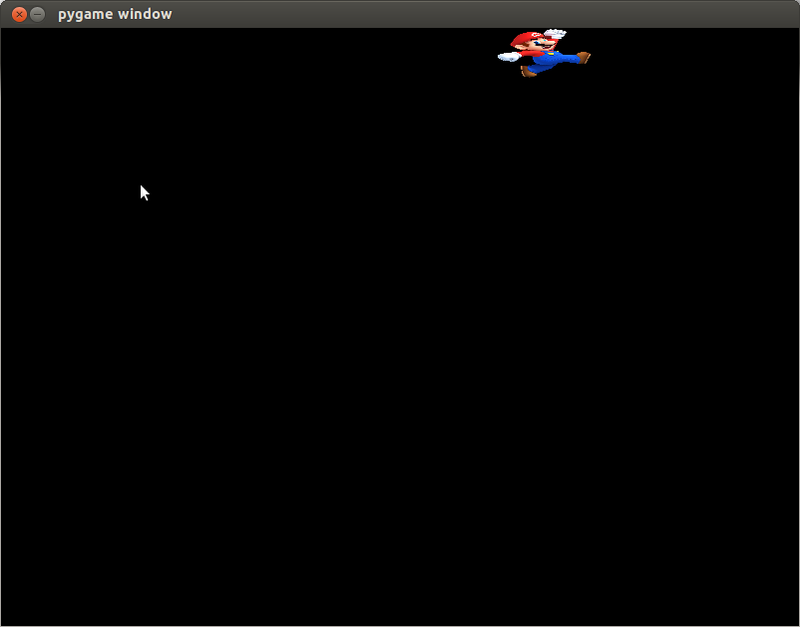 First of all you need to load the pictures into pygame. We use the load() method in pygame.image to do the same. The pictures you get need not always be suiting to your window requirement. Hence we need to resize or transform the pictures to suit to our pygame resolution. This can be done by the scale method in pygame.transform. Now we have loaded the image and transformed it to our need. Now lets draw them onto the screen. We use the same blit() method for drawing the images too. Now put in your Game loop and the for loop to get the list of events. Dont forget the exit event. Now to the program logic. So we are going to make superman fly continously from bottom to up. Hence we have initially drawn superman at the bottom of the screen. So our logic is to bring superman up till the ‘y’ coordinate reaches zero. When it reaches zero we reset to original position at the bottom. By doing this we animate our superman to fly. Now thats not all. There are couple of things we must keep in mind. We must never forget to redraw the background. Here it is the clouds. Or else the animated images gets drawn in unclean background and animation will look some thing like this. For animations use the pygame.time.Clock(). Because the default animation time will differ from machine to machine. If our machine is slow we can see the animation for a glimpse. In faster machine the animation happens in a flash. So to make it uniform we must use the clock object and give the frames per second. Games fascinates all including me :). Playing games is something dear to me like python. This actually inspired me to learn Game Development with my favorite language. So is Game Development possible with Python? Of Course. Even without the game libraries it is possible to make small games in python. I have made a small connect four game without using game libraries in python. But for now let’s leave that aside and focus on Game development using a game library in python called PYGAME. Pygame is one of the famous game library in python with more than million downloads. It is designed to make cool games in python which is built on top of excellent SDL library. SDL or Simple DirectMediaLayer is a low level library on top of OpenGL and Direct3D to interface with audio, keyboard, mouse, joystick, and graphics hardware. 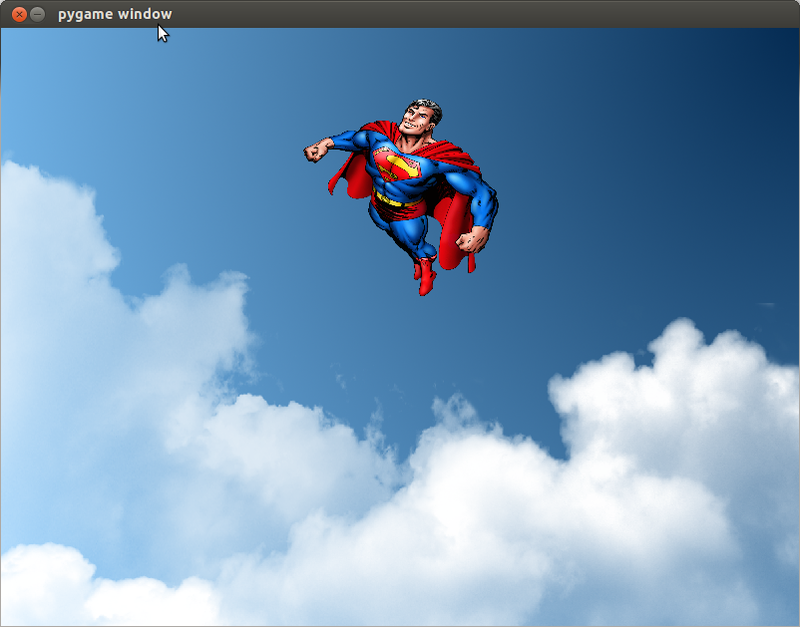 Hence Pygame is highly portable and runs in any platform you name. Now lets get into Pygame directly by creating some cool things. Lets start in the conventional way by creating a Hello World program. For a difference let it be a “First Pygame experiment” Program. # the user himself closes it. # Checking if the event is to QUIT from the game. Now lets discuss how the above was built. As always to access all pygame resources we need to import the module. After importing all the pygame modules we must initialize them. Each and every modules have their own initialization, but it is always good to do a master intialization immediately after import. Now the game runs on a window. Hence we create window with resolution of our choice. Every game does not end on itself. The User interaction only ends the game. Hence it is always wise to have a infinite loop running with a user interaction mapped to exiting the game window. The while loops infinitely till the event happening is a pygame.QUIT event. That will be user closing the window. Again inside the loop we regularly update the window. Now for our business logic in the game. 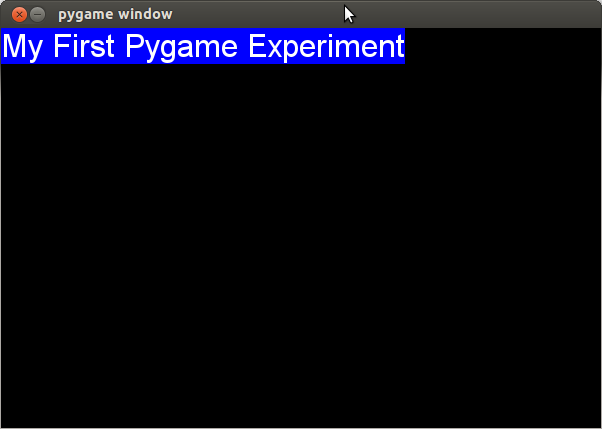 We are going to show the text “First Experiment in Pygame” in the window. For that we are using below code. If you see clearly the text_to_render variable is not a text. We cannot directly give a text to the pygame display. It throws the below error. This means that pygame display always needs a Surface class object and not plain string. So lets create one. Here we are creating a SysFont object which loads a System font to the display. We choose Arial font with 32 size and create a SysFont object. Then using the render method we create a font “First Pygame Experiment” on the display. render method takes in the text to display, antialias arguement which decides the smoothness of characters, font color and font background color. Here we create a font with size 32, white foreground color and blue background color. Now we have our first ever experiment in pygame. A window with our text on it. Hi to All Python Lovers out there !!! I am Krishnan making my entry into blogging about python. 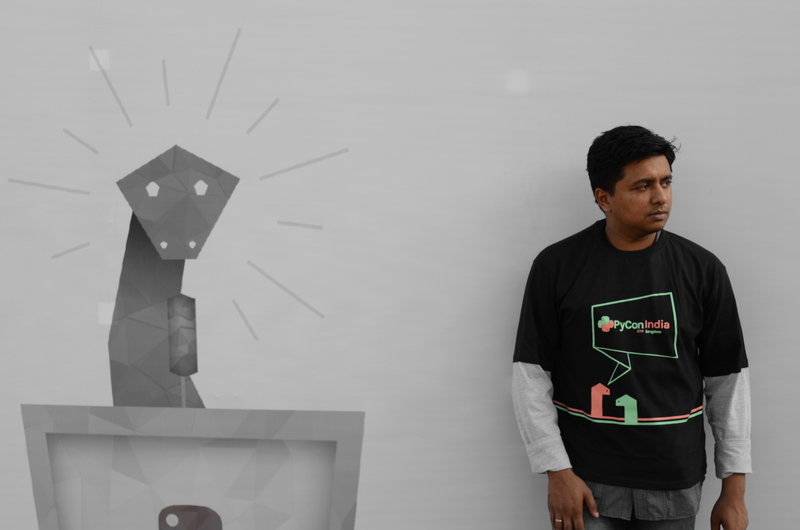 That’s me above with my favorite programming language’s logo and wearing Pycon TShirt:). I have been using python for the past 5 years for Test Automation. I have spent the time writing frameworks, scripts for testing the Device Under Test using Python. Now I am eager to explore the vast applications of Python. I have decided to touch each and every application in python and check out which suites me better. My exploration is going to start from Core python programming to Web development using Django, Flask. Game programming using pygame to Network programming. I am also going to blog about my experiences on the same. So guys out there please welcome my blog and guide me during my first steps into Python programming and blogging.